#Holyhead - Debris from Storm Emma’s damage to Holyhead Marina has been found across the Irish Sea south of Dublin, as North Wales’ Daily Post reports. Polystyrene from pontoons destroyed during the extreme weather event over a month ago was found in Greystones by a group of sea cadets from Holyhead. Holyhead marina users have expressed dismay over the progress of the clean-up operation over the last few weeks. The Daily Post has much more on the story HERE. 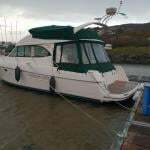 Holyhead Sailing Club (HSC) is working on contingency plans to host the ISORA fleet following the devastation to the North Wales Marina during Storm Emma. it is unlikely the damage will be repaired in time for the ISORA events planned in Holyhead this year but it is not stopping the HSC team from coming up with alternatives. The ISORA start for race three on 12th May and also the finish of race four on 26th May are due to take place at Holyhead. As Afloat.ie reported at the time, the damage in Holyhead both to its racing fleet and the marina pontoons was severe. The ISORA fleet's newest arrival, a brand new Jeanneau Sunfast 3600 named Yoyo, made its debut at Dun Laoghaire Marina this weekend and although only partially commissioned by MGM Boats at this point, the Daniel Andrieu design looks more than ready for the first race of the ISORA calendar next month. As Afloat.ie readers will recall, the twin rudder yacht arrived into Dun Laoghaire Harbour last month and is a sistership to the hugely successful BAM! from Howth Yacht Club. Adapted to solo, doublehanded, and crewed regattas, the Sun Fast 3600 is designed to compete in both inshore and offshore races. The first ISORA race of the season is a 40–mile coastal shake–down on April 21st. Force 12 winds that battered Holyhead Marina, Anglesey have left the marina 'in bits' and boats berthed in the North Wales facility are reported as 'lost'. The sad scene became apparent at first light this morning. It is understood yachts in the marina that were involved in the winter racing series were sunk and there is very little left of the marina itself. The video below was taken at 08:38 this morning. The Holyhead lifeboat was moved to the inner harbour for continuing service. Just as the Jeanneau Sunfast 3600 success story that is BAM! celebrates yet another victory in the West Indies this weekend, a sister-ship is being unveiled in Dun Laoghaire Harbour by Irish Jeanneau dealers MGM Boats. The new Dublin Bay arrival is a welcome addition to the Irish racing fleet that will most likely be seen first racing on the ISORA circuit, according to Afloat.ie sources. The first ISORA race of the season is a 40–mile coastal shake–down on April 21st. The 2018 Irish Sea schedule runs right through to the end of September with 15 races in store thus giving plenty of time for the return of this week's Caribbean 600 class champion to line up against her new rival at a time when ISORA numbers are buoyant. Afloat.ie understands the new 3600 is almost identical to BAM! with a sail wardrobe by North Sails Ireland. One big difference between the two boats, however, is the new owner has opted for a double wheel configuration instead of BAM's tiller arrangement. The new boat is expected to be sailed mostly fully crewed or double-handed. The boat, commissioned by MGM Boats this week, includes a spray finish antifoul by the boatyard. 2017 was the best season for Irish Sea offshore racing (ISORA) in many years with 68 boats taking part in the 15-race series writes ISORA Chairman Peter Ryan. In 2016, 54 boats took part. To put these numbers in context, in 1978, when ISORA was in its “hey-day”, 70 boats raced with an average race entry of 32 boats. We are very close to this again and I am confident that those numbers will be exceeded in 2018. The ethos of ISORA is to provide challenging and satisfying offshore and coastal races for its members and, just as importantly, provide a convivial social scene for those skippers and crews who take part. What is unique about the boats who participate in ISORA is that while they are extremely competitive during races the camaraderie that exists between all skippers and crew, ensures that assistance and encouragement is offered to competing boats at all times. Safety within the fleet is paramount. A 15 race schedule is planned for 2018 that will include 7 offshore races, a 4-race coastal series on the Irish side and a 4-race coastal series on the UK side. The Round Ireland, although the offshore racing apex of the season, is not included in the overall ISORA Offshore Series but ISORA will be presenting prizes and trophies to ISORA boats taking part in this epic race. ISORA will be running an offshore weekend on the 8th-10th June that, together with deliveries, will allow a boat and crew to qualify for the Round Ireland in one weekend. This weekend consists of the Midnight Race from Liverpool to Douglas on the Friday evening and a race from Douglas on the Sunday morning. The full schedule advertised in the Afloat Irish Sailing Annual is downloadable below. ISORA will be organising a pre-season coastal race on the 14th April from and back to Dun Laoghaire. Although not part of the ISORA Series, prizes will be presented after the race. It is hoped that this introductory race will attract new boats that have not yet taken part in ISORA. A party will be organised in the NYC after the race for all participants and members. A successful new development in the national sailing programme will inevitably be something of a revolution. Yet if those managing the event handle it in the right way, the changeover can take place without people thinking that anything really revolutionary – in the sense of a sudden and complete change – has taken place. W M Nixon takes a look at the successful unveiling of the new-style Wave Regatta planned for his home port of Howth for next year’s June Bank Holiday Weekend. Preparation is everything. Quiet work behind the scenes in trying to visualize every practical and administrative glitch which might arise, and how best to deal with it well before it becomes a problem, is essential. Getting key people – decision-makers and can-do people, local, regional and national – firmly on side, is absolutely essential. Testing the waters of consumer opinion with trial announcements and proposals, and the occasional test run maybe disguised as something else, is also part of the process. Yet revealing too much of what is taking shape before it is really ready to go public can do more harm than good. Thus when Howth Yacht Club’s Wave Regatta 2018 was unveiled after a crisp and businesslike Annual General Meeting in the clubhouse on Thursday night, not only was it a very complete and appealing concept in itself, but it emerged fully formed, and in a style well presented to an audience filled with fresh enthusiasm. Howth’s modern marina/clubhouse complex (above) is in stark contrast to the situation pre-1987 (below) when the ISORA racers and the fishing fleet had to share the same small space. The boat at centre is the famous S&S-designed Sunstone (Tom & Vicky Jackson) which in her racing days with ISORA was known as Dai Mouse III. After all, Commodore Joe McPeake had just finished chairing an AGM whose mood was enthusiastic after the publication of a set of figures which showed that the huge extra voluntary effort and support which the club has received from many of its members during the past 18 months has paid real dividends. While the improving mood had become increasingly apparent as the season progressed, by Thursday night if you could somehow have linked it to the National Grid, you’d have lit the village with it. Inevitably, Howth gets compared to the big southside clubs of Dun Laoghaire, and the way their huge reservoir of personnel resources - further augmented by the overall administration of Dublin Bay Sailing Club, and with the large marina run as a commercial venture – frees up a enormous pool of talent to keep a high-powered show on the road. For when all is said and done, only Dun Laoghaire - with its unique selection of stately shoreside facilities - could stage an event like the Volvo Dun Laoghaire Regatta. But in Howth, the one club has to do everything. So instead of trying to rival Dun Laoghaire, today’s Howth sailors see their strength in being themselves in their own special peninsular port, which is neither Dublin nor northside nor remotely southside. On the contrary, it’s emphatically part of Fingal. And it’s indisputably Eastside. On top of all that, as its basic geology is twice as old as anywhere nearby, it is Ireland which is the add-on to Howth, rather than the other way round. However, that’s not in anyone’s mind in Howth at all this weekend, as we realize the leap of the imagination which has transformed some long-established Howth events by combining them with new concepts, and then steering the whole package into a significant gap in the market which had been hidden there in plain sight for all to see. For the overall shape of the 2018 National Sailing Programme is unusual. The biennial Volvo Round Ireland Race from Wicklow has been shifted to the last weekend of June, presumably because its time-honoured slot right on the mid-summer weekend around June 23rd would have clashed with the finish of the Volvo Ocean Race itself in The Hague at the same time. So with the Volvo Round Ireland on June 30th, Volvo Cork Week in its turn was moved back to July 16th to 21st. And while those who seek a fun regatta with holiday overtones have Calves Week in Schull from August 7th to 10th, those in pursuit of racing with recognised national titles at the end of it have the ICRA Nationals at Galway from 15th to 18th August. What it meant to those in Howth was that there wasn’t a major cruiser-racer championship on Ireland’s East Coast for the entire season, and particularly not in June and early July when the heavies generally expect an event of this type. But that realisation came after they’d already set in motion a project to re-invigorate their traditional Lambay Race, which has been staged annually since at least 1904 and maybe earlier. In times past, with smaller craft such as the 1898-established Howth 17s (happily still with us, and stronger as a class than ever), simply racing round the island of Lambay from Howth was enough for a long day’s race. But with newer and much bigger craft joining the mix, all sorts of ways had to be found to increase the length of the Lambay Race for the big boats, while retaining its character. Yet by this stage, the programme generally was becoming crowded, with the revival of ISORA posing new problems of rival events. A partial solution was reached this year when the ever-obliging ISORA Chairman Peter Ryan agreed to incorporate the annual Lambay Race as the main section of an ISORA Race which would start with the Lambay fleet and sail through its course and finish line, but then race on to a finish in Dublin Bay to provide the kind of distance ISORA expects. However, for 2018, the Lambay Race on Saturday June 2nd will be a fully-fledged ISORA event in its own right. But it will literally be a Lambay-Race-With-Knobs-On for the Cruiser-Racer classes, as the organisers are planning a morning start and probably taking in Rockabill and the Kish to provide a perfect miniature offshore course. Having the full ISORA imprimatur on this extended Lambay Race provides the new Wave Regatta with the massive corner-stone which enables the Organising Committee, chaired by former HYC Commodore Brian Turvey, to build a full three-day programme around it, for they can be confident that local One Design Classes such as the Puppeteer 22s and the Howth 17s will already be doing the Lambay Race in its traditional form. As well, Sportsboat Classes like the SB20s and the 1720s will also have the option of a start. And if the IRC Class divisions are made in the right way, we’ll have the J/109s, the J/80s and the J/24s racing as classes-within-classes to add that bit of extra zing. As the possibilities became clearer, one extra bit of information encouraged the Howth group to go for it big time in promoting an event with three days of solid racing as a viable biennial alternative to the Volvo Dun Laoghaire Regatta. This was the news that, in future, in every even year the annual ICRA Nationals will be staged at a non-Dublin venue – August’s Galway venue is the start of this process. This meant that the Howth team really had to get their skates on in order to have a realistic proposition and programme in place in time for an official unveiling at Thursday’s HYC AGM on December 14th. Even with test runs on various aspects of the main idea during the past couple of seasons, the actual countdown time was short enough, but by Thursday night such a complete package could be put on display that they were able to tell us that Fingal County Council were giving major support, there was every encouragement from the Harbour Authority, and HYC member Michael Wright had come on to the Committee to act as shoreside hospitality director, while also bringing in the support of his Wright Hospitality Group. In fact, these days with its proliferation of characterful restaurants and hospitality hotspots, Howth’s shoreside entertainment is soon in place. So it’s the programme afloat which has to match it, and here the organisers have hit the target by having Irish Sailing President Jack Roy take on the role as one of the senior Race Officers, another being former President David Lovegrove. Howth-based Race Officers such as David Lovegrove and Harry Gallagher have long made a major input into Volvo Dun Laoghaire Regatta, so all these top men afloat are accustomed to working with each other in the most demanding situations. They’re also accustomed to inter-acting with the “customers” after racing, and it was their reports of overseas visitors to the Dun Laoghaire Regatta expressing a wish to take part in some sort of major event in the Greater Dublin area every year which encouraged the Howth team to think that, with proper planning, they could provide an alternate biennial regatta which would be different from Dun Laoghaire, yet express the same mood of good but not too serious sport afloat, and high-powered entertainment ashore, with an emphasis on attracting younger participants. Flexibility is the approach. For those who wish to do just the Lambay Race on the Saturday, that’s fine. But for those who want the Full Irish of a really good programme of sport, there’ll be three races on Friday 1st June, and three more on Sunday June 3rd, while the Bank Holiday Monday will be given over to a Family Day which was very popular in 2017, and will be further developed next year. As with everything to do with sailing in Ireland, the weather factor will be considerable. But for those of us who have done more than a few Lambay Races, the good memories linger best, and they’re of an effortless regatta atmosphere with an element of local pride, for it’s the coast of Fingal we’ve been racing along, one of all Ireland’s finest islands we’ve been racing round, and it’s our own home port under the hill that we’ve raced home to. Which makes it fine for those who live locally. But the Wave Regatta Committee, in which Dave Cullen plays a key role as one of the leading ideas experts while officially he’s called Director of Racing, realise that the fact of Howth being on a peninsula and the village being largely residential, with a shortage of hotel bedrooms, can provide a challenge for those who live elsewhere, but want to keep their boats race-ready rather than as floating caravans. So HYC have hired 30 campervans which will be available for rent in the car-park beside the club, and as well local sailors have made it clear they’ll be more than hospitable in providing accommodation. As for the problem of the DART from Dun Laoghaire not starting until late on a Sunday morning, they’ve swung a deal with Dublin Bay Cruises whereby the familiar blue-hulled St Brigid will depart her berth in Dun Laoghaire at 08:15 Sunday morning, bound for Howth and the final day of racing. It’s that sort of off-the-wall yet actually very sound idea which gives us some idea of the thought which is going into this new Wave Regatta at Howth. You can do a lot of sailing in three days if everything is in place, and this team is determined that it will be. Meanwhile, let’s hear it for the home squad, the new HYC Club Officers who were elected on Thursday night, and will have their agenda will filled throughout their time in office, as plans for 2018 include the establishment of a fully-fledged Sailing School within the club. They are: Commodore: Joe McPeake; Vice Commodore: Ian Byrne; Rear Commodore: Paddy Judge; Rear Commodore: Ian Malcolm; Hon. Secretary: Bernie Condy; Hon. Sailing Secretary: Caroline Koster; Honorary Treasurer: David Mulligan. Irish sailing is mourning the loss of someone very special with the death of Dave Whitehead of Kinvara. In his close and strong family circle, throughout an international circle of friends, and among many more in the Galway Bay area, the loss is made more poignant by the fact that he was a very active 75–year-old, brimming with plans for the future, and keenly interested in every aspect of the world today, both within and beyond sailing. His life story is a tale of our times. From Monkstown in County Dublin, he was of a technically-minded family – a great-grand-uncle had invented the Whitehead Torpedo, the first in the world. Young David had started his sailing in Dublin Bay, but after graduating in geology from Trinity College, his career path was in mining, which eventually took him to many corners of the globe, some of them very remote, and others also very far underground. However, an early position in the late 1960s was with Tynagh Mines in the southeast of County Galway, headed by Dave FitzGerald who shared his love of sailing. For a while they were much involved with the little sailing club which functioned at the time on the lake at Loughrea. But the call of the sea and the possibility of a club being established on Galway Bay drew their sailing interests westward, and during the early 1970s David Whitehead contributed much to the early life of Galway Bay Sailing Club, which was being spearheaded by determined enthusiasts like Pierce Purcell and others. Dave had maintained his friendships with Dublin Bay sailing, and through John Bourke with Jack McKeown’s S&S 34 Korsair, he was able to introduce the new sailors of Galway, who at that time were experimenting with being based on Lough Atalia immediately east of the city, to the invigorating realities of offshore racing with ISORA. Dave himself was soon to go on to become elected to both the Irish Cruising Club and the Royal Ocean Racing Club. But meanwhile in Galway the neophyte club accepted his and David FitzGerald’s advice that they should locate their main sailing base at Renville near Oranmore at the head of Galway Bay, and soon Dave Whitehead was making an active input to the GBSC as a sailor who introduced some interesting craft to the growing fleet at Renville, and as a member of the committee. The Honorary Secretary in those early days was Marie White, and in each other they found kindred spirits, and were married. They shared the hope that they would live in due course on the shores of Galway Bay, but to achieve that Dave first had to see through a very concentrated international career in mining. In this, with Marie’s support, he was very successful, working extremely hard both in the field and in board-rooms, rising rapidly through the ranks to achieve positions of significance in the leading global commodities firm Billiton – at the time of his death last week, he was chairman of a number of Billiton’s London-based subsidiaries. He and Marie had long since also succeeded in returning to Galway Bay, buying The Glebe in Kinvara and turning it into an idyllic family home. As for sailing, his interest was if anything greater than ever, and though he had always made a point of finding the best sailing within reach of wherever his various mining jobs took him, his heart was with Galway Bay, where he went though an intriguing array of boats ranging from the Quarter Tonner Frantic aboard which many young GBSC sailors took their first steps afloat, to the classic miniature S&S 27 Shemite – all of them boats which have remained with the Galway Bay fleet under new owners. One he’d achieved his dream of finally settling in the west (where, during his and Marie’s absence abroad, the members had built the first GBSC clubhouse at Renville in 1979) Dave Whitehead was able to put experience gained at many other sailing centres to good use. Though he’d never had any formal training in race management, Pierce Purcell fondly recalls that he proved a natural as a Race Officer, providing his services with enthusiasm, and running things afloat very competently and without fuss. But by now his main enthusiasm in sailing was in cruising, while in life generally it was about learning even more to add to the huge stock of knowledge in his already well-furnished brain, and its deployment on the lively discussions which he relished. Fellow Irish Cruising Club member Ed Wheeler, himself no slouch when it comes to conversations in depth, recalls a voyage home from the Azores crewed by Dave: “The wind-driven autohelm was working very well, so inevitably at mealtimes, and indeed at many other times, there were discussions as we sailed along. You might think you had talked Dave around to your way of thinking, but then he would come up with some totally unexpected but indisputable and perfectly-remembered scientific fact from his warehouse of mental information, and the argument was back to square one”. Typically of Dave Whitehead, when making a Transatlantic passage as crew with Marie aboard La Contenta in the ARC of 2003, the very fact of the boat being well equipped with the latest in electronic navigation aids prompted him to bring along traditional bits of gear to calculate their position, and by the end of the voyage not only was he getting his calculations absolutely spot on, but he had worked out ways of simplifying the time-honoured methods used by the likes of James Cook and other great voyagers. For his own principle cruising boat, he was for many years content with the ingeniously-laid-out Holman & Pye-designed Oyster Mariner 35 ketch Joyster in which he voyaged near and far, and was rewarded with ICC and GBSC trophies. But from the moment he settled in Kinvara, he was also fascinated by the miniature cruising possibilities – the “gunk-holing potential” – of the much-indented southern and eastern shores of Galway Bay. To explore them properly, he went through an almost bewildering variety of small specialist cruisers with lifting keels and easily-handled rigs which enabled him to get to places where no cruising boat had ever been seen before. With his base now in Kinvara, he could also contribute to the changes in the perceptions in the rest of Ireland of the level of sailing in the west, and together with Dave FitzGerald, he was much involved in a major re-balancing of the structure of the Irish Cruising Club. This began with an increase in western-based Committee members, then there was a western Rear Commodore, and eventually Dave FitzGerald served as Commodore from 2000 to 2002, while Dave Whitehead was Rear Commodore from 2006 to 2008, and Vice Commodore from 2009 to 2011. In his later years, he made the shrewd judgment that the unpretentious but very cleverly-designed Moody 27 was the ideal boat for his main cruising needs, while continuing to work with specialists like boat-builder Tiernan Roe of Ballydehob in West Cork towards creating the perfect gunk-holing cruiser for places “where the water is very thin”. In sailing the Moody 27 Mystic, he found an ideal crew in the equally individualistic Peter Fernie who lives on Tawin Island, which is well out in Galway Bay, though connected by a causeway to nearby Ireland. As matched spirits, they moved into an ownership partnership which worked very well, and a round Ireland cruise with an extended visit to the Hebrides in 2016 saw them being awarded GBSC’s David Baynes Cruising Award in the face of some formidable competition. David Whitehead was never lost for words. Whether it was boats, or maritime history in general, mountaineering or rugby, climate change or electric cars, you could be certain that David would have a well thought out position. More often than not, his was a contrary one to the accepted or establishment view, but a position backed up by his incomparable memory. Despite his losing keys and mobile phones like the rest of us, I often wondered whether David had ever forgotten anything he had read or seen in the past. His prodigious recall was exemplified once when sailing up the Cleddau River in Wales, above Milford Haven. This location was not part of our plan, but we had ended up there en-route to Brittany, owing to a number of engine-related difficulties. David spied a moored wooden cutter, and we sailed across to get a closer look. Triumphantly he said: “That’s Driac” and proceeded to give me a detailed history of the 1930s Nicholson built boat: her original owner and cruises, as well as various assorted related ephemera comprising the establishment of the National Maritime Museum in Greenwich, and the evacuation of the B.E.F. from Dunkirk. I always assumed that he had this stuff printed on the back of his eyelids. In the event I googled Driac when I got back home – he was absolutely accurate. Moving to Galway in the ’60s, he had sailed up and down the west coast and further beyond with David Fitzgerald (ICC). His training as a geologist found him working with mining concerns around the world but wherever he was, he found time to sail. He was a founder member of Galway Bay Sailing Club and became a member of the Royal Ocean Racing Club and the Irish Cruising Club in 1972. He became a member of the Royal Cruising Club in 2008. He had raced and cruised many different boats since his days in Trinity College, Dublin. He had owned boats large and small from his first, a 16 foot Paul Gartside designed gaffer to his latest, Goblin, a 16 foot Chesapeake Bay microcruiser which he adapted for gunkholing around Galway Bay creeks. In 2009 whilst Vice Commodore of the Irish Cruising Club, he was diagnosed with lung cancer which he attributed to working in an Australian uranium mine. Nevertheless, and despite major surgery he was sailing his Oyster Mariner 35 Joyster three months later to Tory Island and Lough Swilly. 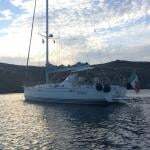 Despite a continually compromised respiratory system, David never let this get in the way of his sailing, with cruises to Wales, Brittany, the Isles of Scilly and the Aeolian Islands as well as the south and west coasts of Ireland. In 2016 we sailed from Galway to the Hebrides and back around Ireland clockwise to Galway in our Moody 27 Mystic. This year, he was sailing in Galway Bay several days before a forthcoming hip replacement operation. Next year was to be an extended cruise to Galicia, as well as a gunkholing cruise in Roaring Water Bay. He was an excellent shipmate and a great companion. He could be uncompromising and pedagogic but was never boring. He was unremittingly positive about life and dwelt always on the future whilst enjoying the past. He will be missed by many”. Our heartfelt condolences are with David Whitehead’s wife Marie, his son Duncan, his daughters Jennifer and Siobhan, his daughter-in-law Kerry, his grandchildren, and his extended family and very many friends. May he rest in peace. 240 ISORA competitors and guests attended the 2017 awards ceremony and dinner at the National Yacht Club in Dún Laoghaire last Saturday writes Mark Thompson. ISORA chairman Peter Ryan kept the evening on track, with awards of both the perpetual trophies and crystal glassware to the top three placed boats in all three fleets, plus prizes the individual results for all competitors in the 14 races series which started in April, and culminated in the season defining “James Eadie” 75 mile race from Pwllheli to Dún Laoghaire which this year decided the ISORA overall champion. Sailors and guests were treated to a champagne reception, followed by an outstanding four course meal devised and cooked by head chef Cormac Healy, served with fine wines and Jack Ryan 'Beggars Bush' whiskey to finish. Michael Boyd RORC Commodore and ISORA guest delivered a humorous story of how the Lyver Race medallions managed to stay at his house, and generously bought Champagne for all the Lyver race competitors present. Other notable awards during the evening were the 2017 Spirit of ISORA “Penmaen Plate” awarded to Charlene Howard who raced “AJ Wanderlust” very consistently all year, often two handed and being based in the Isle of Man faced the greatest number of deliveries. Indeed Charlene and her crew even sailed over for the awards Dinner! Full results are attached below in a PDF of the menu for the ISORA awards night. It was a memorable evening with the spirit of ISORA in full flow with great plans being made for a bigger and better 2018. Prior to the dinner, ISORA held its AGM where the 2018 rules amendments and racing programme were discussed, and a draft schedule published for consideration. Closing the AGM, Peter Ryan, ISORA Chairman, paid tribute to retiring Vice Chairman Gerry Williams for his tireless efforts in promoting ISORA both as a competitor and committee member spanning 27 years. World Sailing will hold a short–handed Offshore Sailing World Championship following approval from the Council at its annual conference in Mexico last week. The new Offshore Worlds will be held in One Design boats to help promote and raise the profile of short handed offshore sailing which represents a significant element of the sport. Selection of equipment, dates and venue as well as arrangements of the Worlds will be decided by World Sailing's Board of Directors after consultation with the Oceanic and Offshore Committee. Ireland's Paddy Boyd, a former CEO of both Ireland and Canada sailing sits on this committee. Sources say the boat is likely to be the Beneteau Figaro 3, as previously reported by Afloat.ie here. Boyd was part of an Irish delegation that attended the World Sailing Conference that concluded at the weekend. In further offshore proposals from the conference, a 'combined' Offshore Sailing World Championship will include the best results from the joint ORC/IRC Offshore World Championship as well as a separate long distance offshore component selected from existing major events. The scoring system will be defined between RORC and ORC with prizes awarded to skippers and crews, not the boat, enabling chartering of boats.